Every year the congregations in the churches which make up the Diocese of St Asaph raise money to support a local charity. 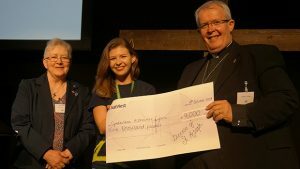 The charity is selected by members of the Diocesan Conference and the money raised is donated at the annual conference each October. At the 2018 conference, Haven of Light which works to raise awareness of Modern Slavery and Human Trafficking was voted the recipient of the 2020 offering. How is the charity selected? Applications are received and validated by the Diocesan Grants Committee. A ballot is held at the Diocesan Conference – the charity gaining the most votes becomes the subject of the Diocesan Offering presentation in two years’ time. How is the Diocesan Offering administered? Donations are collected locally across the whole of the Diocese using various methods. For example, some Mission Areas make a provision in their budgets for a donation to the Offering, others organise fundraising activities or dedicate a service to the Offering. What is the value of the Diocesan Offering? What is expected of the nominated charities that are shortlisted to the ballot stage? Our ‘electorate’ (the 350+ members of the Diocesan Conference) will need to have information about all the nominated charities in advance of the ballot, applicants are therefore expected to provide a brief report, supply photographs etc. What is expected of the charity that wins the ballot? The charity that wins the ballot is expected to send a representative to the Diocesan Conference for two consecutive years. On the first occasion to help to launch the appeal and promote their charity and then to return the following year to accept the Offering at a brief presentation ceremony. Electronic applications are preferred, please email your application.